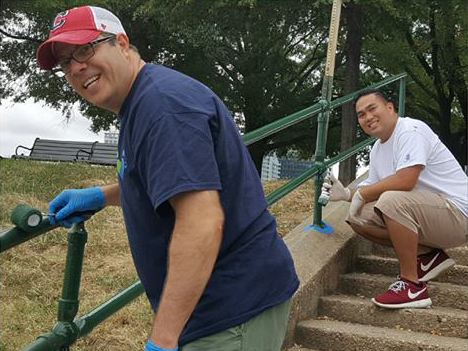 South Harbor Renaissance’s group of dedicated volunteers work hard to maintain the beauty and historic character of Federal Hill Park. Connect with us to learn about upcoming social events and park activities and to join the effort! Check us out on Facebook, TwitteR, And Instagram! Just like you, concerned residents want to preserve and improve the Federal Hill neighborhood we love. That's why our group of volunteers founded South Harbor Renaissance (SHR) in 2011. We dedicate time, talent and money; build partnerships with the City and other organizations; and raise funds to keep the park clean, safe and enjoyable for everyone. Since our establishment, South Harbor Renaissance has raised over $700,000 from grants and donations, but we still need your help! You can make a donation of any amount toward our cause, as well as leave your mark on Federal Hill Park forever by ordering a brick paver. Together, we can build a better Baltimore. The Federal Hill Park playground was designed with a focus on key historic elements, three of which were incorporated in 2014: Fort Federal Hill, Signal Hill Tower, and The Federalist Ship. To complete the park’s original playground vision, South Harbor Renaissance is adding a play train locomotive inspired by the B&O Railroad located on the south side of playground for all families to enjoy. But we need your help! Find out how you can help us reach our campaign goal. Engrave your way into Baltimore history with a personalized, custom brick paver. For only $135, you can pay tribute to a loved one or special person, celebrate a lifetime event, or record your or your family’s name for posterity in the path through the Federal Hill Park Playground. Your donation to South Harbor Renaissance is entirely tax-deductible!